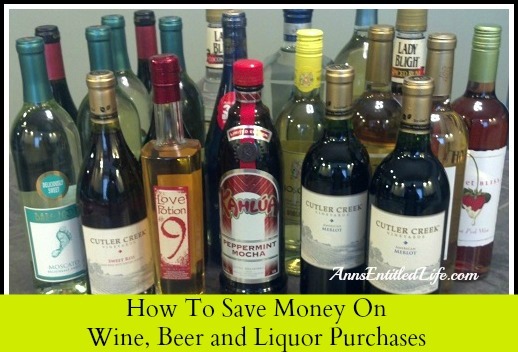 How to save money on wine, beer and liquor purchases? Some people would say that the obvious is answer is “don’t buy it! there, you just saved money”. Ummmm yeah. Well, actually there is a fourth option which is of course, all of the above! The truth is we do like to try new liquors, buy a lot of new liquors on sale (and usually with a rebate), and we don’t consume enough liquor to use all that we purchase. Maybe we should throw more parties? • Know your regional prices. If something goes on sale, you will know if it is a good deal or not, and if it is truly a sale price. • Shop seasonally. Some items are less expensive in the summer, some the winter. If you enjoy cordials such as Baileys, this time of the year can yield sales! • Take advantage of coupons and rebate offers, as your state laws allow. Pair the coupon and/or rebate with sale prices. • Know the contents of your liquor cabinet. This can cut down on redundant purchases. • Shop duty free stores if they are available in your area. • Take advantage of local bargains when traveling. We always try something new when visiting out of state, and bring home a bottle or two when it is a great deal! • Buy Wine, Beer and Liquor on sale. This may seem obvious to some, not as obvious to others. A better tenant would be to Stock-up on sale. That way you will not run out of a party staple. What are your tips, tricks and hints for stockpile a liquor cabinet on the cheap (if you choose not to abstain)? • For more liquor and wine reviews, as well as cocktail recipes on Ann’s Entitled Life, click here. Note: these tips first appeared on my old blog, Coupons, Deals and More. I have a redundant question. What is your most FAVORITE wine of all time. Good ONE!! YES – Do tell!! And I do believe I like the “have more parties” option… hey I know a few girls….. Am I right??????????? Buy wine by the case. Most stores will give you a 10% discount. And it means you drive to the liquor store less often. Thank you for talking about how you can save money on liquor by buying when it is on sale. It makes sense that taking advantage of these offers can help you get what you need for a reduced price. It is important to remember that making sure you are careful and find a store that has a good reputation.